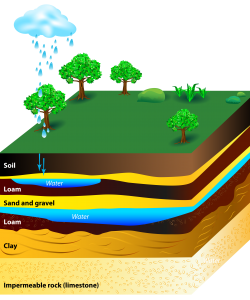 Groundwater is water beneath the Earth’s surface that is stored in rock beds called aquifers. In many rural areas, homes and farms use groundwater from wells, springs and cisterns for drinking purposes. Many cities use this same groundwater as their primary source of water. When water-soluble chemicals, pesticides, and even fertilizers are applied to turf, crops, or soil, it is possible for rain or irrigation water to carry the dissolved chemicals through the soil to the groundwater below. Groundwater can also become contaminated through wells and cisterns, or by improper disposal of pesticides and other agricultural and industrial chemicals. The Type of Fertilizer or Pesticide – It’s water solubility; whether it binds to the soil (adsorption); it’s volatility (how quickly it vaporizes in the air); how quickly it breaks down in the soil; and the proper application rates being utilized. The Soil – Soil that is coarse with low organic matter allows water to move through the soil more rapidly which increases the risk to groundwater. The Site – Groundwater may be only a few feet beneath the soil surface in wetter areas, which results in less filtration by the soil. Rotted tree roots, rock fissures, or other pockets in the soil can provide a direct route to groundwater. The Application – Fertilizer and Pesticides that are injected into the soil are more likely to reach groundwater than those that are foliar or surfaced applied. Also, when applications are made just before heavy rainfall or to already saturated soil, there is an increased potential for movement into groundwater sources. Identify soil type. Coarse, sandy soils that are low in organic matter pose the greatest risks for contamination. Identify nearby water sources including springs, streams, rivers, canals, or other sources that might lead to underground water aquifers. Know the depth of groundwater. (Check with local Extension Services if necessary). Choose fertilizers and pesticides that are less likely to leach in the soil profile. Apply fertilizers and pesticides with the 4Rs in mind. (Right Source, Right Rate, Right Time, Right Place). Do not apply before heavy rainfall or irrigation periods, or when the soil is saturated with moisture. Measure and calibrate fertilizers and pesticides accurately to prevent excess applications. Avoid spills and dispose of storage containers properly. Always read and follow labeled directions. Fazio Championship Blend fertilizers supports and promotes efficient uses of fertilizers for turf areas. Efficient use of fertilizers on turf is a key part of protecting groundwater. Through our top quality raw materials and recommendations for low fertilizer use rates, our products provide immediately available nutrients to turf species to support optimum plant health and growth. Properly applied fertilizer will help reduce turf stress and promote healthy plants, reducing the need for extra applications of pesticides or deficiency-correcting nutrients. Fazio Championship Blend products use the highest quality raw materials which contain low levels of heavy metals and impurities. The fertilizers are virtually non-corrosive, yet highly soluble for efficient turf absorption and utilization.